In a brisk portrayal, a solitary man stands at the harpoon gun on the bow of the Norwegian Whaling Catcher Boat THOR, taking on what the ocean and the ship’s stiff head of speed throws at him while he searches for his prey targets. Deep, dramatic colors in the ocean and smoke-accented sky give way to the slightest warm glow on a distant horizon, and the ever-present ice shelf of the Arctic. 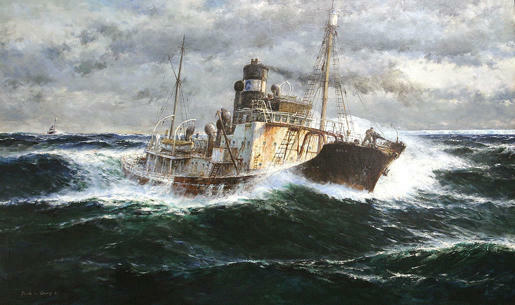 Jack Gray knew this life firsthand as a Nova Scotian mariner and artist. The challenge is recognizable and simple: find and catch the largest aquatic mammals in the world. Where the ships and equipment evolved from their 17th Century beginnings, the make-up of a whaling fisherman remained mostly unchanged. Stalwart, tough, able to stand against a cold chill that could freeze skin to metal on the touch, and stamina necessary to conduct a hunt that could take months if not years. Socially and environmentally concerned interests have changed the face of the whaling industry, rightly so, but it remains an important part of human maritime history. Blazing in action, another Catcher Boat trails THOR, ever a wise tactic in the deep-green Arctic waters. Gray shows the strains of the environment to the rust-streaked ship, and the captured moment under an ominous darkened sky. Gray knew both the peril and the reward the sea could offer. Marine artist and illustrator Jack Lorimer Gray is widely recognized as an accomplished 20th century artist who focused on the challenges of humans working upon the open sea. A lifelong sailor who handled a multitude of ships with a captain’s expertise, the Nova Scotia born man lived a majority of his life onboard one of his yachts, schooners or working boats. Gray’s earthy, realistic color tones and exact sense of perspective depth serve his chosen subjects well. Not particularly interested in glamorizing life and work at sea, he captured the truthful essence of each scene with his artistic paintings. Solitary fishermen, active sportsmen and the traditional sailors of North America are portrayed. Living onboard a larger boat which served as his studio, Gray would travel New York harbor in his 15-foot skiff named S.O.B. His observations evolved into an important body of work which depict the diverse nature of New York harbor. He managed to find an egress onboard the mothballed U.S. navy carrier ENTERPRISE which afforded him a spectacular vantage from which to observe and sketch. His paintings are actively sought throughout North America. When they surface in public sales, prices regularly exceed expectations. He painted marines all of his days, and as he evolved as an artist, each of his paintings display a universal respect for those who identify with the sea.